Now that you have successfully completed compulsory basic training (CBT) for motorcycles, you’ll have put your new-found riding skill sets to the test as a solo learner rider. Remember, your CBT certificate is valid only for two years. Though this is plenty of time for preparation for the practical tests, it can go by surprisingly fast. If you do not pass the practical riding tests within the two year period from obtaining your CBT certificate, you’ll need to take CBT again if you wish to continue riding as a learner. Within the two year period as a learner rider, it’s important that you begin to extend your riding skills until a sufficient level has been gained in order to take and pass the motorcycle riding tests. As a rider, put what skills you have already learnt into practice during your day-to-day riding to gain road experience. Continue with professional training – the approved training body (ATB) where you had taken your CBT will likely provide training right up to practical riding test standard. If not, contact them for information regarding reputable trainers they recommend. As previously mentioned, continue with professional training and as of yet, you may not have taken your motorcycle theory test. You can take the motorcycle theory test before CBT if you prefer, though it isn’t required to take CBT. The licence in which you are entitled to after completing CBT and passing the relevant tests is dependent on your age and the type of motorcycle you use on your riding test. 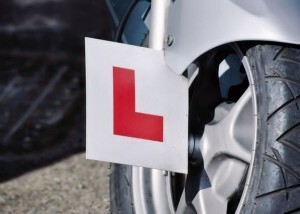 If you are aged 16 years or over, after completing your CBT you will be granted a provisional licence with the category AM, entitling you to ride a moped, scooter or motorcycle style as a learner displaying L-plates. Once you have passed the theory test and moped test module 1 and 2, you can ride without L-plates on a moped up to 50cc with a top speed of 45 km/h (28mph) and can carry a passenger. At age 17, after completing your CBT and motorcycle theory test, you can take the module 1 and module 2 for the category A1 licence entitlement. Category A1 allows you to ride a motorcycle or scooter up to a maximum of 125cc (with maximum power of 11 KW) without L plates, and to carry a passenger. After two years of obtaining a A1 category licence, you may if you wish take the category A2 test which entitles you to ride a more powerful motorcycle. At age 19, after completing your CBT and motorcycle theory test, you can take the module 1 and module 2 for the category A2 licence entitlement. Category A2 allows you to ride a motorcycle with power up to 35KW (46.6 bhp) from 395cc up to a maximum of 500cc. There are two ways to qualify for an A2 licence. Progressive access – if you have held an A1 licence for 2 years, you can take the riding test for category A2, or Direct access – by completing the CBT, passing the theory test and passing the relevant tests for the A2 category. From the age of 21, you can get a motorcycle licence for category A which entitles you to ride any motorbike of any size and power. As with the category A2 licence, there are two methods you can use to qualify. Progressive access – if you have held an A2 licence for 2 years, you can take the riding test for category A. Or the Direct Access method similar to the A2 category, complete CBT, pass theory and take relevant tests for category A. For direct access, you will need to be at least 24 years of age. Motorcycle riding tests module 1 and 2 must be taken from DVSA (Driver and Vehicle Standards Agency) practical test centres. There are various test centres throughout the UK. See motorcycle test centres to find your nearest. Both modules can be booked at the same time but you must pass your module 1 test before you can take the module 2 test. If you do not pass module 1, you will lose the module 2 test fee.